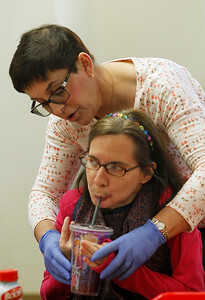 Matthew Apgar - mapgar@shawmedia.com McHenry County Adult Program classroom teacher Cheryl Ungari helps Nicole Toft with her drink during a snack time on Wednesday, April 15, 2015 at the McHenry County Mental Health Board in Crystal Lake. The McHenry County Adult Program nonprofit offers programming to adults with developmental disabilities and is the most recent recipient of the new immediate grants fund program from the Mental Health Resource League for McHenry County. Matthew Apgar - mapgar@shawmedia.com McHenry County Adult Program classroom assistant Kate Goodman reads to Alex Toberman on Wednesday, April 15, 2015 at the McHenry County Mental Health Board in Crystal Lake. The McHenry County Adult Program nonprofit offers programming to adults with developmental disabilities and is the most recent recipient of the new immediate grants fund program from the Mental Health Resource League for McHenry County. Matthew Apgar - mapgar@shawmedia.com McHenry County Adult Program classroom assistant Mike Preston, second from right, helps Dustin Prestley, left, Nicole Toft, center, and Alex Toberman, right, back into the classroom after a tornado drill on Wednesday, April 15, 2015 at the McHenry County Mental Health Board in Crystal Lake. The McHenry County Adult Program nonprofit offers programming to adults with developmental disabilities and is the most recent recipient of the new immediate grants fund program from the Mental Health Resource League for McHenry County. Matthew Apgar - mapgar@shawmedia.com Alex Toberman, left, and Nicole Toft are helped into the shelter of a nearby bathroom by McHenry County Adult Program classroom assistants Kate Goodman, back, and Mike Preston, right, as they perform a tornado drill on Wednesday, April 15, 2015 at the McHenry County Mental Health Board in Crystal Lake. The McHenry County Adult Program nonprofit offers programming to adults with developmental disabilities and is the most recent recipient of the new immediate grants fund program from the Mental Health Resource League for McHenry County. Matthew Apgar - mapgar@shawmedia.com McHenry County Adult Program classroom assistant Mike Preston reads to Alex Toberman, left, and Michael Violet, right, on Wednesday, April 15, 2015 at the McHenry County Mental Health Board in Crystal Lake. The McHenry County Adult Program nonprofit offers programming to adults with developmental disabilities and is the most recent recipient of the new immediate grants fund program from the Mental Health Resource League for McHenry County. McHenry County Adult Program classroom assistant Kate Goodman reads to Alex Toberman on Wednesday, April 15, 2015 at the McHenry County Mental Health Board in Crystal Lake. The McHenry County Adult Program nonprofit offers programming to adults with developmental disabilities and is the most recent recipient of the new immediate grants fund program from the Mental Health Resource League for McHenry County.